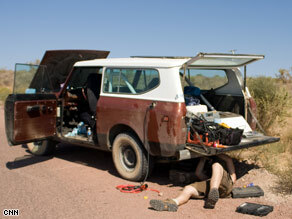 The old Nissan diesel engine in the Scout had, as of Friday morning, taken us about 1,200 miles without incident. Unfortunately, the incident we were already wary of happened just as we were attempting to leave the ranch at Grand Canyon West: Our fuel system clogged up. Our broken down Scout in Grand Canyon West, Arizona. One of the issues with using biodiesel in high concentrations is its tendency to act as a powerful solvent on the various engine components it touches. This leads to premature breakdown of anything made of rubber, and on top of that, it cleans out your engine and fuel tank of any gunk that might have built up over its life as a diesel. In our case, we seem to be suffering more from the fact that the previous person to install fuel lines on the Scout decided to use that stretchy surgical plastic tubing, which our biodiesel made short work of. It turned into goo from the inside out, and the goo went straight into our fuel filter. We thought we were prepared for this. We had enough fuel line of decent quality to replace the surgical tubing. The four spare filters we have with us should have provided an easy way to fix the rest, but we soon found out that they were all the wrong size - much to our chagrin. Thanks to the extremely helpful staff and maintenance crew (especially Dave), we were able to change the deteriorating fuel lines and do as thorough a cleaning of the fuel filter as we could. Things seemed to be working great. It was time for a big ranch lunch. After lunch, we set out again to leave, only to make it a few hundred feet before running smack into the same problem. Dave from maintenance towed us to their shop, and we spent another hour or so cleaning the fuel filter and cracking injector lines and wishing and hoping. We left there, fingers crossed, and made it halfway down the road out before the great clog returned again, with a vengeance. We then rather frantically researched ways to resolve this situation. Our first thought was to join AAA, and we did. As it turns out, they refuse to tow from where we are. A nice waste of time, effort and money that was. The only local wrecker service we could get in touch with demanded $800 in cash. So instead we got a ride with our new buddy Dave, who was going home by way of the nearest city. Which brings us, eventually, to our current locale: a motel in Kingman, Arizona. We have a new mission now, which is to get the Scout running again ASAP. We desperately need to find a new fuel filter, and we'll probably have to rent a car to do it. Though this turn of events is unfortunate, I suppose it's a good thing that it didn't happen in the middle of the desert. The road trip must continue! In my world this is called Murphy's Law............be of good cheer and let nothing disturb you, all this will pass. I am thankful for you that you had someone nearby to help and all will work out I'm sure ..and if you keep checking this blog I'm sure lots of folks will give you helpful ideas to solve your problem. Ahem. Nothing like a learning experience to open ones eyes. Stories of helpful, or not, the reality of hitting the road. One snafoo after another, time for green pizza and green bio-beer. Served by a waitress in green algae bikini. Scylla and Charybdis await. Where be our Thetis? Aha! I spy an Orator. Mayhaps he shall strike a deal with the monsters? Aye! Your soul for a barrel! Head over to the Brunswick Hotel in Kingman for a cold brew. And ask them to give you a set of earplugs. Wherever you're staying tonight, you'll not be far from the train tracks. I really enjoy reading about your road trip... Keep it up! I'm sure you're learning a lot...so are we. Reminds me of some of the cars we had when I was a kid. At least you don't have to go to the office Monday. Oh man you are bringing back memories of old cars and road trips. If it makes you feel any better, I bought a state-of-the-art diesel in 2001 which promptly burned through three of it's state-of-the-art transmissions and fried two sets of its state-of-the-art injectors. All of that while running on filtered, standard, diesel fuel. I have repeatedly had the experience of standing alongside the dead horse, throwing on a helmet, and thanking myself for having the foresight to throw my Mountain Bike on the rack. I will never travel in my 1500 mile-wide territory again without these necessities and two gallons of water. Keep your dead parts, drop them on someones table someday, and figure out what went wrong. Your trip is now a science experiement. And a good one at that. Instead of Blue, emotionally confused, try hopefully Green, and Yellow warm. Good morning? Yes the road trip must continue. I am getting ready for church and will keep you both in my prayers. Godspeed!! "Birdsead for 5,000 miles on One bag"
All the energy in Birdseed. No wonder Birds can soar, migrate long distances. New Physics here. Not a squirrel on NutPower generating in a squirrel cage. How to harness BirdPower, what kind of circular cage ? Carrot before the Donkey, new Detroit fuel efficiency secret ? Here are part numbers of fuel filters that will work. That IH number might be obsolete, but it you are at an International Truck Service Shop, they may have one. I have one of the Nissan and one of the Baldwin filters sitting right in front of me as I type. I'm wishing I could get them to you quickly, but I am 1466 miles away. It may take more than a day, because I'm in the boonies here in Western Iowa. seems to me the problems really started with buying a car sight unseen, then starting on a long journey within two days of taking delivery of a seriously old vehicle. throw some odd fuel into it and go. no shakedown cruise of any sort to work out the kinks. alternative fuels are not the cause of problems here. it's simple lack of preparation. I seriously do wish you guys a wonderful journey, but the lack of preparation for this venture really is a head scratcher. "It's such a shame to spend youth on the young"
Are you running commercial bio or are you converting cooking oil ?? If you are running B-5>>>B99 in a vehicle that has previously been running regular diesel, of course your filters are clogging. Bio is an extreme solvent that dislodges old oil build up in your tank and lines causing you to have to change filters until it is all cleaned out. I now have 80,800 miles on my diesel jeep liberty and I constantly switch between low sulfur, B-99, B-10, B-20 and B-5. Same filter as new because I did not have a lot of gunk to clog the filter. I'm a Jerk– Shoulda read some of your blog before commenting. I see you are purchasing commercial Biodiesel and not running chicken fat. Real shocker...30 year old scout with surgical hose for fuel lines couldn't drive accross the United States on BioDiesel. It's one thing to buy a vehicle sight unseen...but to not have it checked out mechanically before setting out on a long trip...is just dumb. I'm glad you both weren't out in the sticks somewhere when it broke down. My wife and I live in Southern California...last year in April we bought a 2005 VW Passat TDI in Ohio. It was at a Ford dealer, and they were awesome to deal with...they put on new tires before hand, and then took it at our request to a local VW dealer to have a pre-sales inspection done...the vehicle checked out perfect. Anyway, we drove 2300+ miles home over 7 days, through 9 states, and had a blast...it was a great road trip that we will never forget. We totaled up that it took $183 of BioDiesel to get home...but it was a lot cheaper to buy BioDiesel a year ago. The car made the whole trip on B2-B50 blends of BioDiesel, even though it had 65,000 miles on it (miles using only petrol diesel), we never had to change the fuel filter. We saved about $5000-6000 by buying the vehicle in Ohio...it took $2000 for the trip. We would do it again in a heartbeat. So with a little advanced planning, hopefully your next road trip will be a little smoother. I agree with Ed L., you should have done some research on biofuels before you just decided to use it. It does not work with older fuel systems that are not designed to run on it as you are finding out. When this "experience" is all over please do not castigate biofuels because of your own ignorance in the required technology. I have a Chevy Silverado that was designed for biofuel and it runs just fine. I'd bought a car wired with speaker wire and surgical tape once. It was still a good car, but I had enough sense to undo the crappy wiring and rewire it before I drove it. If your do a story on biofuel, upgrading fuel lines, and even splurging for a fuel cell (easy to remove and clean) would make sense, But hey- it's your knickel. Wow I must confess you make some very trehnanct points.